This past Sunday I put my dogs into the car and headed out on a journey. I drove up to Newburyport to go to the Farmer's market. When I arrived, it was too late, the market was closing up, so I decided to wander through one of my old time favorite stores: Red Bird Trading. Fortunately I didn't find anything I thought I needed to own, but I did feel inspired. The store is really more of an art gallery. From there I spent a fair amount of time in the Jabberwocky Bookstore. I finally purchased Paul Harding's book, Enon, which I've been wanting to read after having loved Tinkers. I also bought a book for my daughter called Winter World by Bernd Heinrich. She has been a nature lover all her life, and in this lovely book the author "awakens the undiscovered mysteries by which nature sustains herself through winter's harsh, cruel exigencies." The resilience of our New England wildlife has always amazed me, and I briefly considered adding the book to the growing stack of books on my own bedside table. Fortunately, reality flicked me on the side of my head, and while stopping to enjoy a cup of soup, I enjoyed skimming through the new book I would surrender over to my daughter. I had one of the most wonderful days, and I think my dogs did too. The best thing about it for me was that I started it out not knowing how it would end. On my car ride home, I pulled over several times to photograph the sunset. The brilliance is always there. I guess we sometimes just have to go on a short journey to find it. "I haven't a clue as to how my story will end. But that's all right. When you set out on a journey and night covers the road, you don't conclude the road has vanished. And how else could we discover the stars?" With my dogs in the car, it was now time to drive over to Plum Island and walk the beach. I couldn't believe how empty it was...oh joy! I wouldn't have to worry about my Jack Russell attacking some unsuspecting little puppy, and destroying my mindful journey. Fortunately I had remebered to bring my camera. This tree above greeted us as we approached the beach. 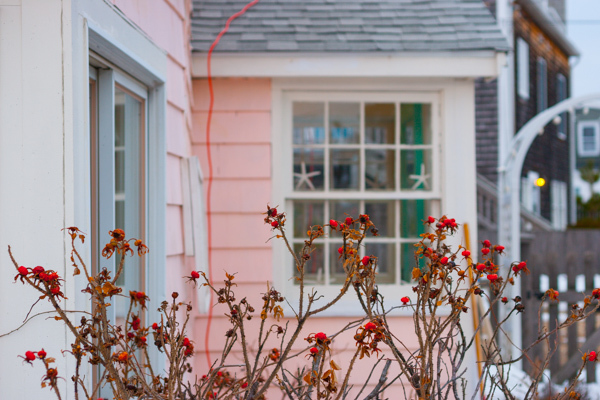 Just when I was beginning to accept & appreciate the subtle achromatic shades of winter, this little pink cottage warmed me into rememebering & feeling all the color and activity quietly awaiting us around the corner.